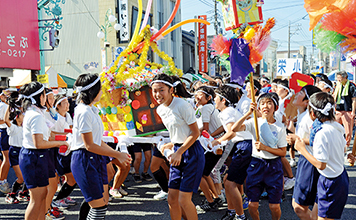 This festival began as a way for Sosa residents to get to know each other (fureai means “bonding” or “contact”). The event includes a children’s mikoshi (portable shrine) and a hayashi festival orchestra, both of which parade around Nosaka Fureai Park as nighttime approaches. There’s plenty of other fun to be had too, from singing, to taiko drumming, and even Bon-odori dancing! 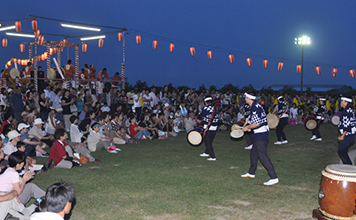 Komamane and the Ichiba Festival are both held on July 25 each year. 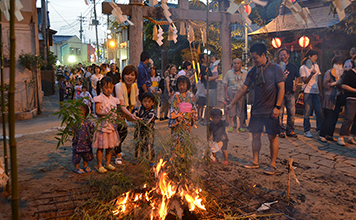 At this event, festivalgoers visit a special ceremonial area in the corner of Yaegaki Shrine and burn bamboo, offering prayers for a healthy harvest, prosperous business, and good health. 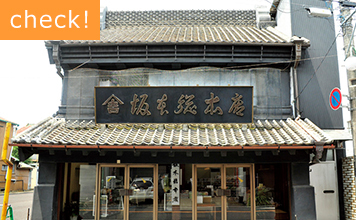 Sakamoto specializes in rakka-senbei (peanut rice crackers). The building itself is located on Honmachi-dori Street and is a Registered Tangible Cultural Property, having been constructed in the earthen dozo-kura (plastered wall storehouse) style of old. At 300-plus-years and counting, Yaegakijinja gionsai is one of Chiba’s most significant celebrations. 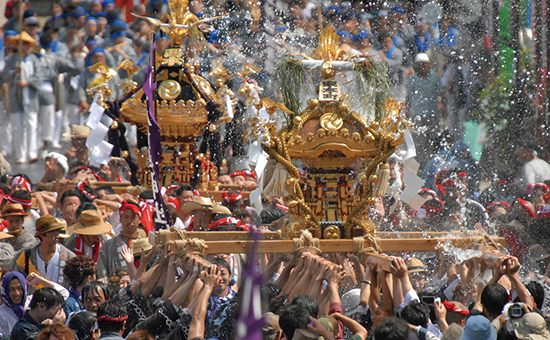 The event features a parade of twenty mikoshi both around Yaegaki Shrine and throughout the city, with participants yelling “Anrya doshita!” all the while. Enshrined at Yaegeki is Susano’o Mikoto, the god of matchmaking — so no doubt love will be in the air too. Yokappe roughly translates to “How nice!” or “That’s great!” in the Sosa dialect. The mikoshi seen and used in this festival is handcrafted by Sosa elementary schoolchildren. There are also stalls, dancing events, and entertainment shows. Visitors to and participants in the Goshinkousai pray for a healthy harvest, prosperous business, and safe travel. A mikoshi and hayashi parade of traditional flutes and taiko drums makes its way through the city’s Node and Kawabe districts before finally arriving at the seashore. 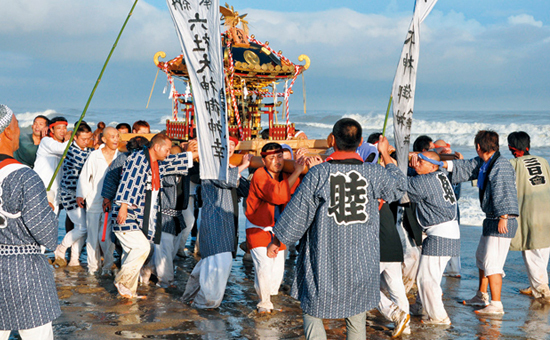 The sight of the energetic mikoshi procession splashing in the water and kicking up sea spray is both breathtaking and invigorating at the same time. 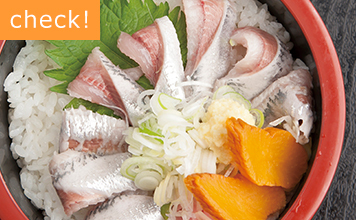 After the mikoshi parade, make your way to Iwasawa-so on the Kujukuri Beach Line and get a taste of the deliciously fresh iwashidon (long sardine rice bowl).